"We're not born with pride. We take pride. Pride in celebrating who we were born to be." 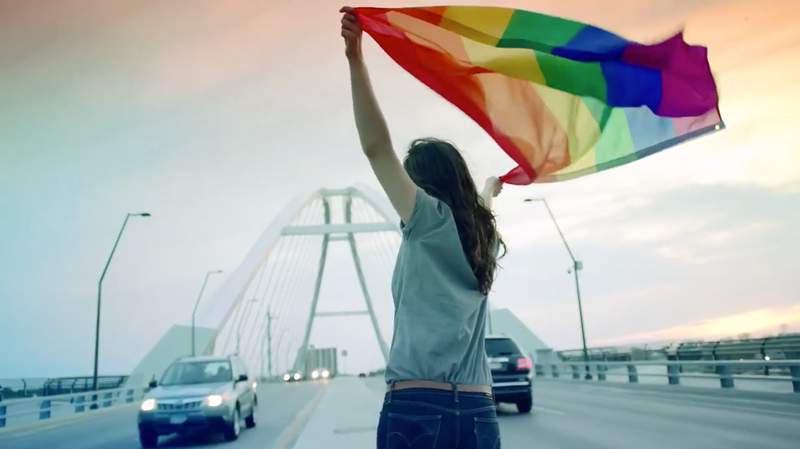 That's the message of Target's #TakePride campaign for Pride Month, shared across the retailer's social channels this week, and led by an 80-second spot that mixes animation, live action and documentary footage to create a message about awareness and equality. "We're not born knowing where our life will lead, the obstacles we'll face, the joy we'll find," the voiceover says. "We're not born knowing that these milestones are also stepping stones in helping us find our footing in what we stand for, and who we'll stand by." The spot speaks to an evolving understanding of one's true self and respect for one's place in the world. And it does so in forthright fashion, noting that "heartbreaks" and adversity shape human experience and character. Its imagery acknowledges the long, complex, often rough road to enlightenment, mixing shots of San Francisco's 1978 Gay Freedom Day parade with contemporary footage of two dads and their new baby. So, the ad's about a journey of discovery—for those in the LGBT community and, ultimately, for all of us. In a blog post on Monday, Laysha Ward, Target's social responsibility officer, unequivocally stated the chain's position: "Target proudly stands with the LGBT community, both as a team member and team player through all that we do—from our volunteer efforts to our long-standing partnerships with groups like Family Equality Council and Gay, Lesbian & Straight Education Network, to the very products we carry in our stores and online." A gallery of rainbow- and "Love Is Love"-themed T-shirts, bow-ties, shorts, flip-flops and assorted paraphernalia follows. Target is, after all, a for-profit venture seeking to sell stuff to as many consumer segments as possible. Yet its LGBT pitch is in step with the times, and in some ways transcendent, rather than opportunistic or cynical. Just a decade ago, many mainstream marketers would have shunned such an appeal, fearing a backlash and boycotts from the right. Now, these pitches are becoming commonplace, part of the increasingly rich and inclusive lingua franca of modern life. That's a shift we can all be proud of.